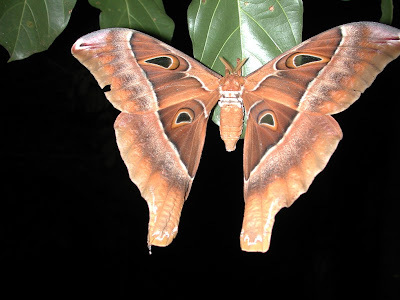 The Hercules Moth Coscinocera hercules (Misk.) is the largest and among the most spectacular of Australian rainforest moths. It is a common visitor to lights in the eastern tropics and always attracts attention because of its large size. Females are larger than males and live longer than the one or two days that the males do. Males exist only to mate and then they are done. Most don't survive longer than the first night. They are easy prey for a variety of predators. The most common predator at my lights is the Black Butcher Bird that comes along on first light to check the sheet for goodies. The moths seem to come to the lights on cooler nights in spring and summer. Peter Shanahan took some great photos of the large larva of this moth recently prompting this post. The larvae feed on a large number of common rainforest trees and, therefore, the species itself is quite common. Murdock de Baar recently published notes on the biology of two rainforest moths in the Australian Entomologist. Both moths occur in the Kuranda rainforest as noted below. Bracca rotundata (Butler) appears at the light sheet nearly every night. It is a geometrid with a wingspan of around 50 mm but for some reason does not look much like a geometrid. It usually rests quietly and remains well after the lights go off in the morning. It must be distasteful to birds and lizards because the moths often remain on the sheet throughout the day even though honeyeaters and other small birds continually visit the smorgasbord of small insects. De Baar reports that the larva (caterpillar) of B. rotundata was found on the rainforest vine, Austrobaileya scandans and were brightly coloured black and white and brilliant orange. It would seem that they are aposematically coloured and distasteful to birds as the adults seem to be. Buck Richardson has used this moth in his Mobile moth Mandela #2. The Large Leaf Moth Oxycophina theorina has a different story. This moth is a member of the Thyrididae, a diverse family with some destructive species. O. theorina rarely comes to our lights. It is a little smaller than Bracca but much more robust. We would average no more than two per year. De Baar found them feeding on street plantings of Macarangia tanarius in Normanton, Qld., a locale far-removed from rainforest. M. tanarius is a rainforest primary understorey tree. The caterpillars feed inside the stems of the trees and cause damage. de Baar, M. 2008. Life history notes on Bracca rotundata (Butler) (Lepidoptera: Geometridae) and Oxycophina theorina (Meyrick) (Lepidoptera: Thyrididae) Australian Entomologist, 35: 141-143.